Justin London shows how to implement pricing algorithms for a wide variety of complex derivatives, including rapidly emerging instruments covered in no other book. Utilizing actual Bloomberg data, London covers credit derivatives, CDOs, mortgage-backed securities, asset-backed securities, fixed-income securities, and today’s increasingly important weather, power, and energy derivatives. His robust models are designed for both ease of use and ease of adaptation, and may be downloaded by the book’s purchasers from a secured Web site. 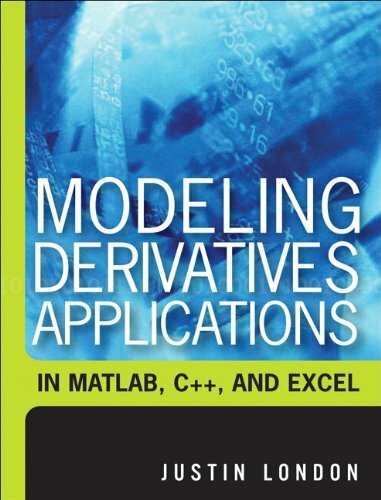 Modeling Derivatives Applications in Matlab, C++, and Excel will be indispensable to sell-side professionals who model derivatives; buy-side professionals who must understand the derivatives offered to them; experienced quants; developers at Wall Street firms; and any financial engineering practitioner or student entering the derivatives field for the first time. The entire book utilizes Matlab, C++, and Excel. Users need Matlab installed, Visual C++, and Excel. In addition, some examples using Matlab toolkits are used: Chapter 1 makes use of the Fixed-Income Toolkit. Appendix A makes use of the Financial Derivatives Toolkit and Matlab Excel Link. These toolkits do not come with the book, but can be obtained from Mathworks. Downloadable models available ONLY to purchasers of this book. Purchasers receive a unique access code enabling secure access to downloadable, prebuilt code and templates for Matlab, C++, and Excel. If you have any questions about this product by Pearson FT Press, contact us by completing and submitting the form below. If you are looking for a specif part number, please include it with your message.